A homily offered by the Rev. Dr. C. Eric Funston on the Sixth Sunday after Pentecost, June 26, 2016, to the people of St. Paul’s Episcopal Church, Medina, Ohio, where Fr. Funston is rector. As many of you know, this past week was a harrowing one for my wife and for me; specifically, Wednesday was one of those days you would rather not have to live through. In the afternoon, I was told by a urologist that I probably have prostate cancer, and later that night Evelyn nearly died from pulmonary embolism. She is OK now – I will be leaving right after this service to bring her home from the hospital – and my diagnosis will be either confirmed or proven wrong by a biopsy in about a month. So all is well . . . but, really, I’d rather go back to Tuesday! And I’m not the only one who’d like to start the week over! 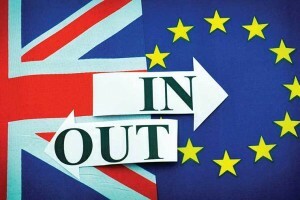 No doubt, you have heard about this week’s “Brexit” referendum in Great Britain which decided whether the United Kingdom would continue to be part of the European Union. There were the Remainers or the “Ins” on the side of doing so, and the Leavers or the “Outs” on the side of exiting the Union. The “Outs” won to the shock and horror of nearly everyone else around the world. The pound sterling lost more than 30% of its value in a matter of hours. Stock markets tumbled; the FTSE 100 index (the British equivalent of the Dow-Jones Industrial Average), which had closed the previous day at £6,388 opened the next morning at £5,789, a drop of more than 8.5%, inching back up during the day to a final loss of 3.15% The Dow itself closed down 610 points, its eighth-largest point loss ever. In my humble opinion, the entire exercise of the referendum, from the decision by the Conservative government of David Cameron to hold it, to the very poor campaign run by the Remainers who simply didn’t believe they could lose, to the patently dishonest campaign waged by the Leavers, to the eventual outcome has been and is an exercise in monumental stupidity! And that brings us to today’s lessons, to Elijah’s call to Elisha to be his servant and apprentice prophet, to Jesus’ encounter with three potential disciples who wish to follow him but have other business to attend to before hitting the road. Elisha had such business as well – he wished to say good-bye to his parents – and Elijah allowed it (although the Hebrew is unclear; we cannot tell if he did so supportively or grudgingly). The text from the First Book of Kings doesn’t tell us whether Elisha did, in fact, kiss his parents. What it tells us is that he slaughtered the oxen with which he was plowing, cooked them over a fire made by burning his farming equipment, and fed them as a farewell feast to his co-workers. We sometimes speak of burning our bridges behind us; Elisha prophetically acted out such a burning – the destruction of the return path in this feast of boiled oxen. Nostalgia was no longer an option for the young prophet-to-be. Elisha, a farmer who had plowed a field, seems to have known that you have to watch carefully in front of you to keep the furrows straight, that you have to look forward not behind. “Look backward and you will swerve one way or another.” (Rogness, Michael, Commentary on Luke 9:51-62) And so, to avoid doing so, he destroys that which might lure him to look backward. and so it became a lie. and how much is a lie. We’re never going to change the past. And we are never, ever going to go back to it, especially not to that sanitized impression of the past with no negative emotions that nostalgia offers us! If we dwell on it, we are trapped. The Brexit Outs wanted to make their country “great again.” What they got was a monumentally stupid mess of unknown proportions that no one knows how to handle, a country in turmoil where the Prime Minister had no choice but to resign, a nation now fracturing as politicians in Scotland call for a second independence vote and politicians in Northern Ireland seek a poll on whether to leave the United Kingdom and become part of the Republic of Ireland. The Brexit Leavers wanted to “take back their country.” What they got was a free falling economy, a nearly 10% reduction in the value of their investments and pensions, and a very uncertain future. They were trapped by the false promises of nostalgia. Don’t get me wrong! I understand the lure of nostalgia, the desire to go back to some simpler and emotionally better time, even one that never existed. As I said, I’d like to go back to Tuesday! But we are never, ever going to go back to – nor recreate – the past! Mark 6:7-9 ~ He called the twelve and began to send them out two by two, and gave them authority over the unclean spirits. He ordered them to take nothing for their journey except a staff; no bread, no bag, no money in their belts; but to wear sandals and not to put on two tunics. A few years ago I took a sabbatical. It was my first (and, so far, only) sabbatical in 40 years of professional life, 25 of them in ordained ministry. I went to England, Scotland, Wales, and Ireland for a total of three months. The first two weeks I visited pre-Christian and early Christian sites in southern Scotland, northern and western England, and Wales. Then I flew from Edinburgh to Dublin. Checking in for the flight, I learned that I had misunderstood an airline website and my baggage was overweight. Substantially overweight! The fees and penalties amounted to nearly £300! (I paid more for my baggage to go one way than for myself to fly round-trip.) I’d brought books for a course of study I was undertaking in Ireland; I’d brought a summer’s worth of clothing; I was carrying a heavy CPAP machine I use while sleeping; I was way, way overweight. I could have carried nothing, ” no bread, no bag, no money in [me] belt,” and purchased everything in Ireland for less than those airline penalties. I guess I would have needed the money, but the bread, the bag, and everything else I didn’t need. We carry so much that we don’t need. That’s what this story always says to me. We carry so much that we don’t need, that gets in our way more than it helps, that weighs us down and impedes us, that distracts us from what we are supposed to be doing. Jesus is clearly telling his disciples, originally the Twelve and, through them, us, that we don’t need all that stuff. We need some good footwear and something to lean on when we’re weary, and that’s about it. Anything else we may need we can acquire along the way; in fact, the promise of the story is that we will acquire it – it will be provided when it is needed. Take Jesus’ advice: don’t carry all that baggage! Since, therefore, the children share flesh and blood, he himself likewise shared the same things, so that through death he might destroy the one who has the power of death, that is, the devil, and free those who all their lives were held in slavery by the fear of death. What is fear of death but fear of the unknown? The fear of death and the unknown brings anxiety, despair, and a frantic search for meaning. The fear of death and the unknown distracts us and makes us afraid to truly live. 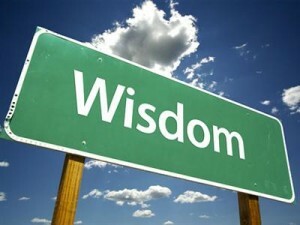 We end up fearing both death and life; we end up not attending to those things which are most important. Yesterday, I woke up with an aching lower back. As the day progressed, the ache became acute, changing from ache to stabbing pain; it localized itself on the right side of my back. When the stabbing sensations occurred, the pain radiated around my right flank and into my abdomen. They got worse. “Kidney stone,” I thought, “I must have a kidney stone.” I’ve never had a kidney stone, but what I was experiencing seemed to be exactly what others have described as the symptoms of a kidney stone. I decided to seek medical advice. It turned out to be no help. Diagnostic activities (urinalysis and a CAT scan) said it wasn’t a kidney stone. So what was it? What is it? It’s still here. I woke up with it again today. I’ve taken pain medication and applied heat, and they have helped with the discomfort . . . but the source remains unknown. So I am concerned. Is my concern “fear?” Yes, to some extent it is. Is it disabling? It’s certainly distracting! Both the pain, which limits my motion, and the concern (or fear) which keeps my attention focused on it, and thus not on . . . my prayers, my work, my regular activities, the things important in my life . . . the distraction holds me in thrall. My imagination runs wild and I envision all sorts of dire and deadly medical conditions to explain my pain, when I know full well it’s probably nothing more than a pulled muscle. To the extent that I focus on the pain and its unknown source, I am a slave to my discomforts, both physical and psychological. 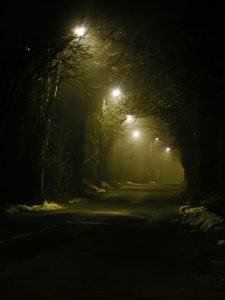 A petition from an old Scottish litany prays: “From ghoulies and ghosties, and long-leggedy beasties, and things that go bump in the night, Good Lord, deliver us!” It is a prayer for release from the fear of the unknown, a release the Letter to the Hebrews assures us we have already been given. The power of the unknown has been destroyed by God in Jesus sharing our flesh and blood, with all of its aches and pains and unknown ailments. So today, I choose to be free of the pain. I may still feel it, but I won’t let it or fear of its still-unknown source distract me from getting on with life. This sermon was preached on Sunday, March 17, 2013, at St. Paul’s Episcopal Church, Medina, Ohio, where Fr. Funston is rector. In Ainm an Athar, agus an Mhic, agus an Spioraid Naoimh. Áiméan. Dia dhaoibh ar maidin, gach duine. Beannachtaí na fheile Padraig oraibh. That’s more Irish than I’ve spoken in nearly two years! What I said was, “God be with you this morning, everyone. The blessings of the Feast of St. Patrick be with you.” In other words, Happy St. Paddy’s Day! Everyone loves to be Irish on St. Paddy’s Day. Even though we Funstons being descendants of Anglican Irish (or as the Irish would say, “Protestants”) did not have much, if anything, to do with the Irish communities of my childhood, we still (like everyone else) enjoyed St. Patrick’s Day. We would go to the parades, see and hear the pipe-and-drum corps, and all the other traditional sorts of things. On the evening news, we would see the reports of parades in other places, especially the big one down Fifth Avenue in New York City. And we would usually have corned beef and cabbage for dinner. I have no problem with people dressing kilts (which aren’t really Irish, at all), putting green food coloring in beer, eating corned beef and cabbage (which is also not really Irish), or any of the other silly things people do on this day. It’s all part of the fun. Many like to watch Irish-themed movies on St. Patrick’s Day. My favorite is the heartwarming tale of a boxer’s return home in The Quiet Man, but I also like the mythical nonsense of Darby O’Gill and the Little People, or the intense drama of The Field, or the whacky comedy of Waking Ned Devine. Those movies are the only times I hear anyone say, “Top o’ the mornin’ to ye” or “Faith and begorrah.” At least, I’ve never heard anyone say those things during any of my trips to Ireland. The worship committee thought we ought to step away from Lent for a day (because March 17 today falls on Sunday) and celebrate St. Patrick. After all, on March 17, the whole world is Irish . . . but the man we commemorate wasn’t Irish and it would be much truer to his memory if on his feast day all the world tried to be not Irish, but Christian. 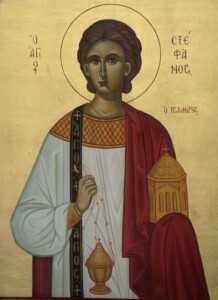 Patrick, who was a Romano-Brit (meaning a Roman who lived in Britain) was the son of a minor imperial official named Calpornius, who was also a deacon in the church; his grandfather Potitus was a priest. Around the year 406 A.D., at the age of 16, Patrick was kidnapped and made a slave in Ireland to a minor tribal king. After six years, he escaped and returned home to Britain, and then went to Rome. There he was ordained a priest and a bishop and, according to the chronicle of Prosper of Aquitane, was appointed bishop to the Irish by Pope Celestine I; he arrived back in Ireland in 432 A.D. He landed near modern-day Belfast and set up his principal foundation in Armagh, which is now considered the Primatial See of Ireland. He ministered primarily in that part of the country known as Ulster. Patrick was not the first bishop appointed to bring the Christian faith to the people of Ireland. Ciaran and Palladius came before him, but their mission (primarily in Munster and Leinster, further south) did not bear the same fruits as Patrick’s. So today, what we celebrate is not Irish identity or heritage; today, we celebrate the success of a mission to spread the Christian faith. For St. Patrick it seems the faith which passed the test was deeply Trinitarian and deeply evangelical. He is credited with using the shamrock, now one of the national emblems of Ireland, as an illustration of the Trinity – three lobes, yet one leaf – although that is probably an 18th Century legend rather than a historical fact. And as you heard, the Gospel lesson for his commemoration is the Great Commission: “Go therefore and make disciples of all nations, baptizing them in the name of the Father and of the Son and of the Holy Spirit, and teaching them to obey everything that I have commanded you.” Christ’s final words to his apostles before ascending into Heaven. This evangelical, Trinitarian faith — not green beer nor Celtic music nor corned beef and cabbage nor Irish-ness itself — but trust in God the Father, God the Son, and God the Holy Spirit shared with and commended to everyone around us, this is what we celebrate when we celebrate the Feast of St. Patrick. Now there are three kinds of martyrdom that are counted as a cross to us, namely, white, blue, and red martyrdom. It is white martyrdom for a man when he separates from everything that he loves for God, although he does not endure fasting and labor thereby. The white martyrs left everything dear to them — homes, families, familiar surroundings, even Ireland itself — to spread the Gospel in distant lands; white martyrdom was a pilgrimage on behalf of Christ that might be extended permanently so that they would never again see their homeland. They went first to Scotland and the north of England, but then further afield to Holland, Germany, Scandinavia, Switzerland, and even further. Like the man who had brought Christianity to their homeland, they held a deeply Trinitarian and deeply evangelical faith; and it is that faith which we celebrate when we celebrate St. Patrick’s Day. Let us remember that confession on St. Patrick’s Day and try not so much to be Irish, but try to be better Christians. Let us be like Patrick, who was not Irish, but Christian, and like him let us follow Christ’s Great Commission. If we must be Irish on this day, let us be like those Irish white martyrs of old, and commend the faith that is in us, a faith that is deeply Trinitarian and deeply evangelical. While they were stoning Stephen, he prayed, “Lord Jesus, receive my spirit.” Then he knelt down and cried out in a loud voice, “Lord, do not hold this sin against them.” When he had said this, he died. And Saul approved of their killing him. That day a severe persecution began against the church in Jerusalem, and all except the apostles were scattered throughout the countryside of Judea and Samaria. Devout men buried Stephen and made loud lamentation over him. But Saul was ravaging the church by entering house after house; dragging off both men and women, he committed them to prison. On the second day of Christmas the church remembers a murder, the martyrdom of Stephen, and our Daily Office lectionary won’t let us forget it. Often the readings of the Daily Office seem to have nothing to do with the season and they seldom are tied to a saint’s commemoration, but today the morning and evening readings tell the whole story in gruesome detail. The green martyrs were those who left ordinary society for the life of a hermit on the mountaintops or islands of Ireland following the example of the Egyptian anchorites. Eventually, they merged their individual dwellings into the monastic communities which dominated the Irish church from the 6th through 9th Centuries. White martyrs went further. They left Ireland altogether as missionaries. The first of these were Columba and his followers who founded the monastery at Iona. Others following their example went into northern Europe and beyond. The 2nd Century theologian Tertullian said that “the blood of the martyrs is the seed of the church.” This is usually understood to mean that through the sacrifice of their lives the “red martyrs” led others to conversion and, on this Feast of Stephen, we see the great example of that in the eventual conversion of Saul, the zealous Jewish persecutor of the church, into Paul, the equally-zealous Christian missionary. But it seems to me that the blood of the green martyrs and the white martyrs, which was not spilled but continued to course through their veins during a life of prayer and service, was equally effective in the conversion of others. It is not so much the blood of the martyrs but, as the original Greek word says, the witness of the martyrs, the example and testimony of the martyrs of all sorts, red, green, and white, that nurtures the growth of the church. On this second day of Christmas, we should remember that, in some sense, we are all called to martyrdom; we are all called to witness to our faith in the Child whose birth we continue to celebrate. All too often, I think, we go through our daily lives with no an awareness of, nor gratitude for the work of the holy angels in our midst and on our behalf. Modern Christians, especially Protestants and Anglicans, seem to be a reluctant to acknowledge the angelic ministry or to call upon the angels (or the saints) for help. But angels are God’s first creatures; created to sing God’s praise and glory, they are God’s ministering spirits, sent as messengers to God’s people (as Scripture witnesses again and again) and to assistance us as heirs of salvation. The effectiveness of the angels’ work in our lives depends upon our cooperation; the more we cooperate, the better. So, how do we do that? How do we cooperate with the angels? 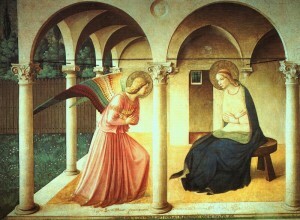 At the very foundation of angelic cooperation is regular prayer and contemplation of God and God’s messengers. Openness of spirit and readiness of will are the proper attitudes of our prayer. This sermon was preached on Sunday, August 26, 2012, at St. Paul’s Episcopal Church, Medina, Ohio, where Fr. Funston is rector. On the cover of our worship bulletin this morning is a depiction of King Solomon’s Temple. 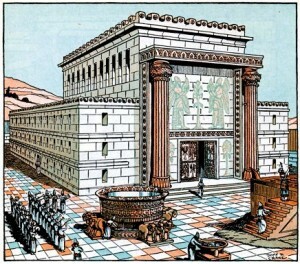 It’s an artist’s rendering of someone’s reconstruction of the Temple based on the description of its construction in the Old Testament record. Our first reading today (from the First Book of Kings), as long as it was, is just a small part of the dedicatory prayer that King Solomon offers when the Temple is finished and consecrated. The building of the Temple marked a very significant change in the Jewish religion. Well, really, let’s not call it the Jewish religion because it wasn’t that, yet. Let’s just say, “The religion of the people of Israel.” These people were not, though we often imagine them to be, strict monotheists. Even in this prayer Solomon leaves open the question of whether there might be gods other than their God: “O Lord, God of Israel, there is no God like you in heaven above or on earth beneath.” There might be other gods, lesser gods perhaps, demigods, or even demons, part of a heavenly pantheon of gods, but this God, the God of the People of Israel is greater than any of those others. At this time, all the different nations, sometimes even different clans or families, had their own religions, their own gods. And nearly all of these religions believed the gods to be sort of tied to the land. If you moved from one place to another, you stopped worshiping the god of the first place and took up the worship of the god of your new residence. If a woman married outside of her family or tribe, married into a different clan, she would give up the religion of her family and take up that of her husband. The People of Israel’s God, however, was different. Their God was not tied to a particular place. Their God was connected to a holy object, instead. God was associated with the Ark of the Covenant which they had created in the desert to contain God’s holy relics, the tablets of the Law given to Moses at Sinai (together with a pot of manna and Aaron’s staff). They carried the Ark with them, actually before them, as they traveled through the desert, as they crossed into the Holy Land, as they conquered the Canaanites and took possession of the country. David designed the Temple, but he never built it. His son Solomon was the one to do that. So the Temple was finished, the sacred implements from David’s tent had been moved into it, the Ark of the Covenant was installed into the Holy of Holies where only the High Priest would be allowed to go and Solomon offers this long prayer of dedication. In it he asks a very important question: “But will God indeed dwell on the earth?” (1 Kings 8:27) By building the Temple, Solomon sought to provide God a place to dwell on earth and, in so doing, he made the religion of his people more like that of their neighbors than it had been. By the time of Jesus, Solomon’s question had been firmly answered by the Jews. Yes, said their religion, God will dwell on earth, in this place, this Temple in Jerusalem. In the birth of Jesus, however, God gave a different answer: God will not dwell in a building in a particular place; God will dwell with and among God’s People: as the Gospel of John affirms, “The Word became flesh and lived among us.” (John 1:14) Will God indeed dwell on earth? Yes, God will live among God’s people as one of us. God lived among us as an infant born in Bethlehem. God lived among us as an itinerant rabbi who had no home. God lived among us as a rabbi accused of being a rabble-rouser. God lived among us as a rabble-rouser condemned to die a criminal’s death. God lived among us as a criminal executed on a cross. On the night before he died, he gathered with his friends for a Passover meal. There is some debate as to whether it was a Seder, the sacred meal of Judaism, but if it was he radically changed its nature, just as Solomon building the Temple had radically changed the nature of the religion of Israel. In the Passover meal, Jews become one with their ancestors; the Passover story is brought present to them in the ritual of the Seder and they, in turn, live through the Passover story, but the meal does not bring God into their midst. When Jesus took the bread of affliction and said, “This is my body,” when he took the cup of blessing and said, “This is my blood,” when he told his followers, “Do this when you remember me,” when he promised, “Where two or three gather, I am there,” Jesus gave us a power and an obligation unlike any given before to any people by God. We have the privilege to bring God present among us in the Bread and Wine of the Eucharist, the Christ’s Body and Blood. Where were you on July 20, 1969? In July of 1969 I was living in a boarding house and studying in Florence, Italy. The boarding house or pensione in which I lived, Pensione Frati, did not have a television. My landlord, Colonello Roberto Frati, arranged for me and the other Americans living there to go to his sister-in-law’s home where we could watch Neil Armstrong’s and Buzz Aldrin’s moon landing on her TV – this great big box of a television set with a tiny black-and-white screen. We all gathered around that box peering into that tiny screen listening to the Italian news commentators and struggling to hear the American commentary behind them. I’m sure that when we heard of Commander Armstrong’s death we all thought about wherever we were on that day at that moment when he stepped out of the lunar lander and became the first human being to walk on another world. What almost nobody knew until a long time afterward was that something else happened on the moon that day. Buzz Aldrin, a devout Christian and an ordained elder in his Presbyterian congregation, had taken a communion kit with some bread and wine to the moon. In the Presbyterian Church, the lay elders of the church who serve a function similar to our vestry members, are actually ordained by their congregation, and that ordination empowers them to bless the elements of Holy Communion. At the time Aldrin and Armstrong landed on the moon, the pastor and members of his Presbyterian church were watching TV but unlike most of us, they were also celebrating communion. 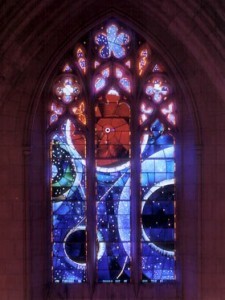 Armstrong joined them across space, blessing the bread and wine on the moon and partaking there of Holy Communion. In the act of Holy Communion we are joined with Christians everywhere and everywhen — with all those in every place who also take part in the Eucharistic feast, with all those who have done so at ever Eucharist since Christ’s last supper with his disciples, with all those who will celebration Communion in the future. We are joined with them and we are joined with God in Christ as we eat of his Body and drink of his Blood, no matter where we are on earth or even on the moon. Will God indeed dwell on the earth? Yes! Will God dwell on the moon? Yes! God dwells with God’s People wherever the memory of Jesus is invoked in the Holy Communion, wherever bread and wine are blessed and consecrated the Body and Blood of God incarnate in Christ. God will dwell with God’s People across time and across space, even on the moon, and wherever else in this Solar System or beyond we may go, so long as we do this in memory of Jesus. Amen. Jesus, as we have just heard, said, “Anyone who hears my word and believes him who sent me has eternal life, and does not come under judgment, but has passed from death to life.” He did not, however, say that anyone who hears his word and believes in God would not die … and so we are here this morning to mourn our loss of Eileen Tough Harrington, to remember her life, and to celebrate her entry into the Presence of Almighty God. She has “passed from death to life,” larger life with the Saints in Light. ‘Tis joy, ’tis triumph then to die. ‘Tis nature’s precious boon to die. In her time of youth, as a young girl of six years of age, Eileen emigrated from her native Aberdeen, Scotland, to the United States. As a young woman she “seized the valued prize” of a two-year college degree in business skills and became an executive secretary. “Dour Scot” though her heritage may have been, she did enjoy life – she and her brother Frederick became dancers and traveled the country entertaining others with their ballroom and tap dancing; she also loved to read and enjoyed word games and crossword puzzles. And, of course, her church membership was very important to her. A member of this parish for 27 years, she was the head of St. Paul’s Altar Guild in the 1980s. I don’t know if Eileen taught Susan and Richard about gardening and butterflies, but I do know that she taught her children, as all mothers do, about life. I know that they know that we are all children of God; they know it because she knew it and I’m sure that with her Scots determination she made sure they learned her lessons. That Scots determination (or perhaps some might call it stubbornness) is one of the things I first discovered about Eileen. From time to time, my wife Evelyn and I would have dinner with her together with her daughter Susan and son-in-law Paul. At some point during the evening, Eileen would simply decide that she’d had enough to eat and, apparently, enough of the company as well. “I’m ready to go,” she would say. And when Eileen was ready to go, everyone else had better be ready to go, too! So last week, when Susan called me on Wednesday and said, “The nurses at Western Reserve have called and said Mom has decided to go,” I knew exactly what she meant. Eileen had finally come to that point when, as the poet Barbauld had put it, trembling limbs refused their weight and films had dimmed her the sight, when clouds obscured her mental light, and she was ready to go. It’s not really an “unknown shore”. It is, rather, our eternal home, God’s kingdom where there is no pain, no death, no sorrow, no crying, but the fullness of joy with those who have gone before, with all God’s saints. Today, we rejoice that Eileen has gone there before us. May she rest in peace and rise in Glory! Amen.